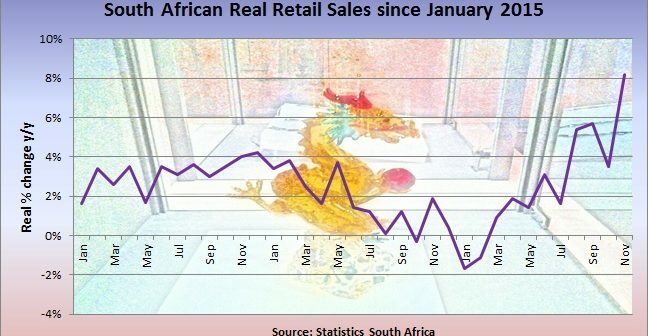 In another sign of the recovery in the South African economy, real retail sales soared by 8.2% year-on-year (y/y) in November after a revised 3.5% (3.2%) y/y gain in October according to Statistics South Africa (Stats SA). This was double the expected 4.1% y/y increase and the highest y/y increase since June 2012. 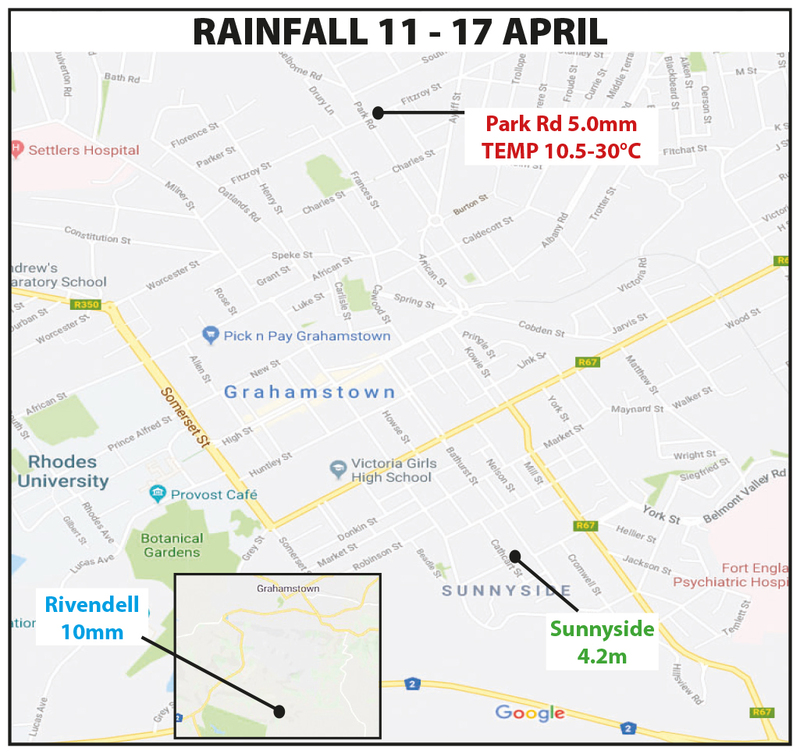 It shows that the economy is doing far better than economists and ratings agencies expected, although anybody observing the frenzy at some of Grahamstown’s shops on Black Friday would not have been surprised by the blow-out increase. It seems as if almost every data release since August has exceeded the consensus forecast. 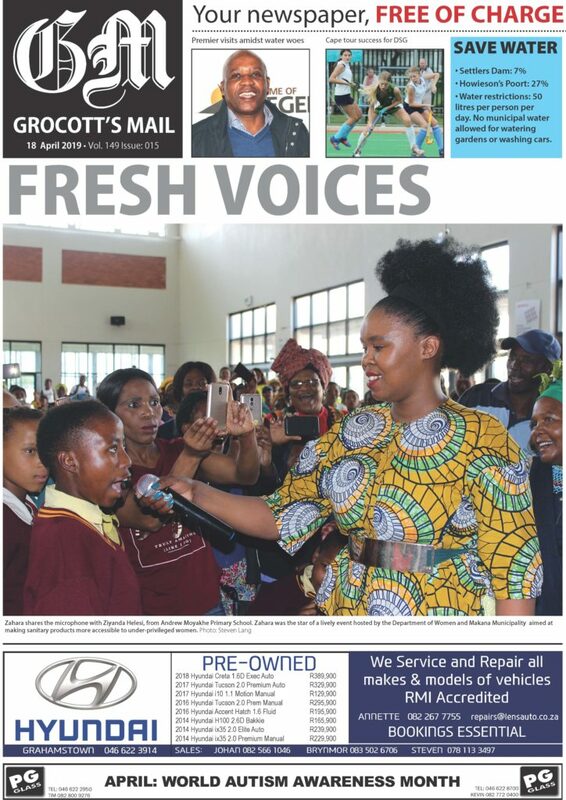 BankservAfrica, Africa’s largest automated payments clearing house, said bank transactions volume on Black Friday were twice the daily average, so economists should not have been caught unaware. 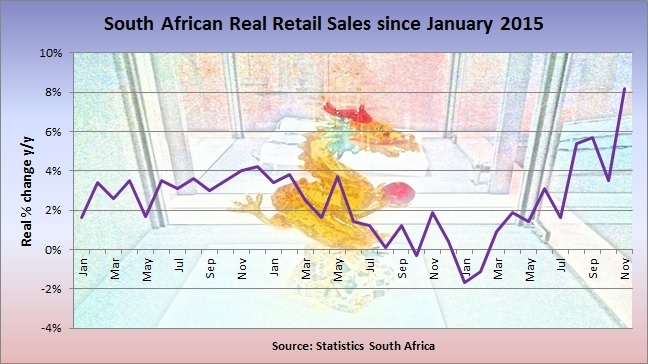 In terms of retail segments, “all other” retailers, which includes online retailers, had the highest y/y increase at 20.8%, followed by retailers in household furniture, appliances and equipment at 14.1% and retailers in textiles, clothing, footwear and leather goods at 12.4%. 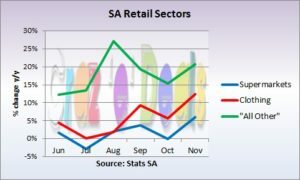 The retailers that Stats SA classifies under “all other” retailers include retail trade not in stores, in other words online retailers and which was not even separately classified ten years ago; retailers in reading matter and stationery; retailers in jewellery, watches and clocks; retailers in sport goods and entertainment requisites; retailers in ‘other’ specialised stores such as hobby stores; repair of personal and household goods; and retail trade in second-hand goods in stores. 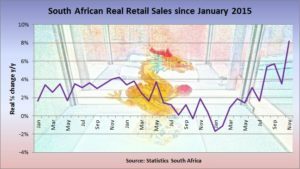 “All other” retailers in November were the third largest category at 12% after general dealers at 42% and clothing retailers at 19%. “All other” retailers have consistently exceeded the y/y growth rates of the other sectors this year.